Natural remedies — that is to say, the use of plants like herbs — has been part of our fight against illness for thousands of years. Although some plants have now been shown to have more of a placebo affect than anything else, there are those plants that show great results in treating the symptoms of common ailments. 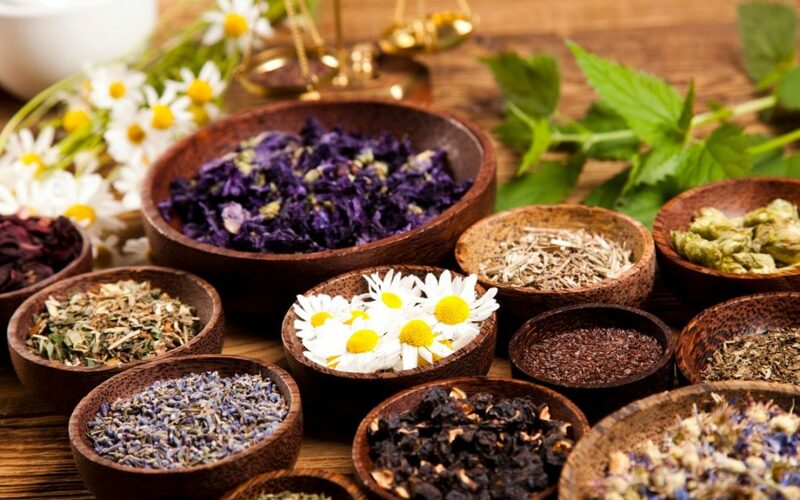 It is important to note that you should always consult a doctor before starting to use any of these herbs as some of them can have bad reactions with other medication you may be taking! Unfortunately “natural” doesn’t immediately mean “safe”! However, here are some herbs that have been tested and found to have real benefits. Also called Marian thistle, it contains compounds called “silymarin”. Milk thistle extract studies have shown that this extract can regenerate, regulate and strengthen liver functions. In centuries past it was cultivated as a vegetable, being called “very wholesome” by Thomas Tryon in The Good Housewife (1692), a much more current comment on milk thistle is by Steven Schechter (author of Fighting Radiation & Chemical Pollutants With Foods, Herbs & Vitamins [Vitality, Ink]) who stated that: “I consider standardized milk thistle seed extract the most beneficial herbal product for liver detoxification, regeneration and protection, and, in general, one of the most universally necessary herbal products…”. Description of milk thistle — A tall annual or biennial, growing up to 4ft in height. It has large, deeply lobed, spiny leaves with white veins and purple thistle flowers in summer. Only to be taken on medical advice and supervision as it may cause high blood pressure and water retention besides interacting negatively with many medicinal drugs. Licorice has been researched as an antiviral and in the treatment of gastrointestinal ulceration according to Amanda McQuade-Crawford (herbalist and director of the Ojai Center of Phytotherapy). McQuade-Crawford goes on to add that “Licorice gets into a painful, contracted, tight digestive tract and coats the raw places, relaxes the clenched-up muscles and acts as a local anti-inflammatory”. The licorice root has also been indicated as a soothing decongestant. Description of licorice — Licorice is a hardy perennial that grows up to 4ft tall. The leaves of the plant are pinnate and divided into 9-17 oval leaflets. The flowers are violet and pea-like and the seed pods long. The licorice’s roots are usually harvested when the plant is 3-4 years old and dried before using. Also called “purple coneflower”, German studies have shown its extract contains proteins that can help to protect noninfected cells against viral infections. This is one reason why its used short-term by some as an influenza preventor. Another German study found echinacea to be effective in allergy treatment. This is because it helps to prevent tissue inflammation due to harmful foreign toxins. Schechter notes that the plant’s infection-fighting properties stem from the ability it has to neutralize a harmful enzyme that’s involved in the infection process. Description of echinacea — Echinacea is also a hardy perennial, growing about 4ft tall with ovate-lanceolate leaves. The flowers are purplish-pink and daisy-like, but with raised conical centres that are made up of prickly brown scales. Some cultivars have white flowers. Echinacea angustifolia and Echinacea pallida are species with similar properties. Also known as daisy flower or “Roman chamomile”, this little flower is possibly best known as a tea that is quite easy to obtain and that helps to soothe and relax one, especially before sleep, it also has an antiseptic and anti-inflammatory action. A report published in the Molecular Medicine Reports in 2011 notes that the “sedative effects (of chamomile) may be due to the flavanoid apigenin that binds to benzodiazepine receptors in the brain”. The tea is also said to be helpful in relieving painful menstruation. As an ointment, it can be used for various skin irritations and insect bites. As a steam inhalation — using either the essential oil or the flowers themselves, it can be helpful to relieve sinusitis (and gives a deep-cleansing facial steam to boot!). Don’t drink too much, though, as overuse can cause vomiting and vertigo. Description of chamomile — Chamomile is an evergreen perennial with fine divided, feathery leaves. They grow to a height of about 6 inches, while the long stems containing the daisy-like white flowers may reach a height of 1ft. Only the flowers of the plant is used. Known in China and India since the earliest times, ginger is cultivated for medicinal properties as well as for culinary uses. Ginger is used in decoctions for colds, chills, and feverish infections. However, it is also well-known to help for nausea, travel sickness, indigestion, stomach upsets, and menstrual pain, and is often taken in the form of tea. Research interest in ginger has increased markedly over the last few years, and, although currently results are more observational than mechanistic, it is hoped that this soon will change and the specific healing compounds in ginger identified. Description of ginger — Ginger is a perennial, reed-like plant with thick and branching rhizomes. It grows to a height of 3-4 ft. Leaves are bright green, lanceolate, and alternative arranged on short, sheathed stems. Ginger’s flowers are yellow-green and are borne in dense cones on separate stalks than the leaves. Not to be taken in high dosages, in pregnancy or if taking anti-coagulant medication. Garlic is probably mostly known for adding a delicious taste to pasta sauces and other foods (or for keeping vampires at bay), but garlic can reduce nasal congestion and ease cold symptoms — especially when ingested raw. Garlic juice has antiviral, antibacterial, and anti-fungal properties and can relieve insect bites, bee stings, and the itching of chilblains. Description of garlic — Although garlic is a hardy perennial, it is often cultivated as an annual. The plant’s bulbs are made up of cloves in papery, white or pinkish-white casing. The flat leaves of the plant grows to a height of about 2ft. Garlic flowers are greenish white. As garlic helps to prevent blood clotting, it should not be taken when taking anti-coagulant medicine. Other names arnica is known by, is: leopard’s bane, mountain arnica, mountain daisy, and mountain tobacco. Arnica’s anti-inflammatory properties (when applied externally to the affected joint, for instance) has been shown in recent studies. It is most commonly used to treat sprains, bruises, and aching muscles. The Pharmaceutical Journal, in the article “Unravelling the confusion aroundarnica’s herbal and homoeopathic use”, states that “[t]he evidence [clinical and non-clinical] suggests that OTC herbal arnica is a useful first aid treatment”. Description of arnica — Arnica is an alpine perennial that has a basal rosette of small, ovate, downy leaves and flowering stems. The plant grows to a height of 1-2ft. The arnica flowers are golden yellow and resembles daisies. Arnica is highly toxic and shouldn’t be taken internally. It should also not be used on broken skin. Use with the advice from qualified medical practitioners. Of the 300 aloe species, only a few have medicinal properties, of which the aloe vera is the most potent. Other names for this aloe, includes: Barbados aloe, Cape aloe, and Curaçao aloe. The aloe has many properties, of which includes the soothing and promote the healing of sunburn, burns, eczema, skin irritations when applied externally. When taken internally it can have laxative properties (when it is usually called “bitter aloes”) and may help with digestive problems. Description of aloe vera — Aloe vera is a succulent, about 2-3 ft. in height., that bears clusters of elongated, very fleshy, green-grey leaves that are spiked at the edges. The flowers of the aloe vera is yellow and tubular. Do not use internally without professional healthcare advice and never use internally during pregnancy. Although wintergreen was later also gotten from the birch Betula lenta, and most wintergreen nowadays is produced synthetically, the original Wintergreen is native to North America. Used for aching muscles and joints, the methyl salicylate contained therein has similar properties to aspirin and is anti-inflammatory. The essential oil has antiseptic properties and it is also used for massaging joints afflicted by rheumatism and arthritis. Description of wintergreen — Wintergreen is a prostrate shrub, some 6 inches in height, that has dark green, glossy, oval leaves. Its flowers are in clusters and is small, white, drooping, and bell-shaped. Scarlet berries follow. The oil is toxic in excess. Bode AM, Dong Z. The Amazing and Mighty Ginger. In: Benzie IFF, Wachtel-Galor S, editors. Herbal Medicine: Biomolecular and Clinical Aspects. 2nd edition. Boca Raton (FL): CRC Press/Taylor & Francis; 2011. Chapter 7. (Accessed: 3 April 2019). Houdret, J. (2009). The Practical Illustrated Home Herbal Doctor. London: Hermes House. Leivers, K. (3 September 2005). Pharmaceutical Journal, “Unravelling the confusion around arnica’s herbal and homoeopathic use” (Accessed: 7 April 2019). Nursing Assistant Guides. (2009). 25 Ancient, Proven Home Remedies With Science Behind Them (Accessed: 3 April 2019). Tanner, C. (5 January 2018). “Herbs Scientifically Proven to Ease Anxiety Revealed”. Mail Online. (Accessed: 3 April 2019). Taormina, S. (2019). “Top Ten Best Researched Herbs”. All Natural. (Accessed: 3 April 2019).